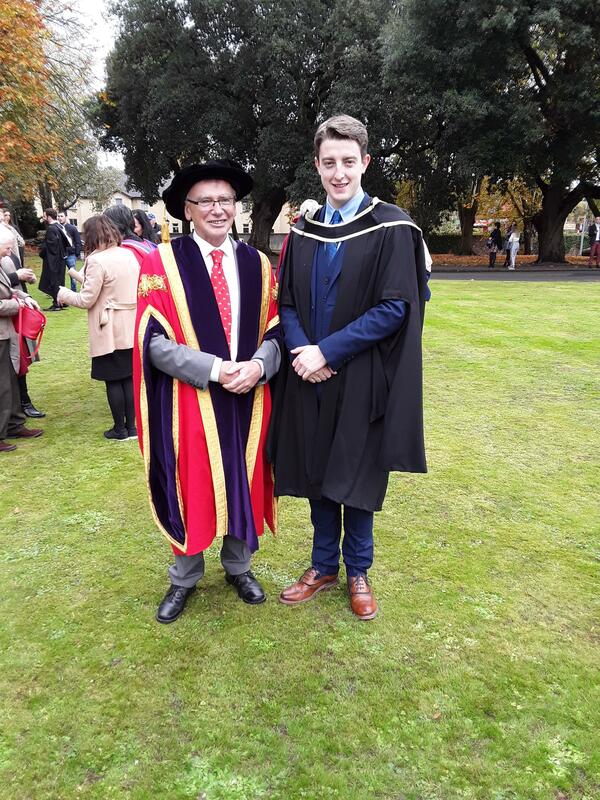 Kieran studied the BA (Hons) International Business followed by the Master of Business in Internationalisation and was based on the Cork Road Campus from 2013-2018. I chose my course for a variety of reasons. The main one being that the course was a follow on to my undergraduate degree and offered two Master's degree's by studying both at WIT and Brest Business School in France. I knew having this on my CV after college would really stand out. I chose to study at WIT given the School of Business' outstanding academic reputation and having spoken with many alumni who graduated from WIT and have since gone on to have successful careers in a broad variety of industries both nationally and internationally. The highlights of the Master's course were definitely getting to study International Business Negotiations in Brest Business School for part of the second semester. This was a great experience interacting with French students and we had a fantastic professor who made the week thoroughly engaging. At WIT I gained a greater appreciation and understanding of both the professional and academic environment through different modules with practical applications such as undertaking market research studies for live business projects which will have a real world impact. The student group for the MBSI stream was also small which allowed for greater interaction with lecturers who really valued the thoughts and openness of students in order to develop critical thinking skills which are greatly sought after in the graduate labour market. I remember being very excited and enthusiastic about starting college at WIT. I have made many friends and created a large network of people whom I will keep in touch with for the throughout my professional career. Read the business section of newspapers. There are daily events which effect the business environment and international economies which play a huge role in both the academic and professional worlds. Having an understanding of what’s going on in the world around us from a business and economic perspective definitely gives students an edge in lectures and around exam time. As well as this it is vitally important that you have a genuine interest in the field of study you wish to pursue, at Masters level many projects are self-determined giving great scope to research business related topics that are of real interest to you. I gained a broad appreciation of international business modules particularly marketing and finance which opened many doors for me upon graduating. The hardest part after graduating was deciding which career option was the best for me to start off with. I made many contacts via LinkedIn which greatly assisted in applying for jobs in the run up to graduation. I have a large pool of connections that I got advice from on where my next step should be after my experiences both within and outside of WIT. Thankfully I was in a position to choose between jobs that were offered to me given the strength of my CV having studied at WIT and undertaken many extra curricular activities. I was a Class Rep for the MBSI 2018 course. This was a great experience getting to engage with my course leader and the Graduate Business School Administration staff all of whom were dedicated to making the student experiences at WIT as great as possible. I was fortunate enough through hard work to have made the Dean's List as an Undergraduate student and won the John Hume Waterford Credit Union Bursary in 2013 for achieving academic excellence. Outside of college I was active in Irish traditional music and regularly taught music locally in the South East, whilst on our study abroad trip to Brest I was able to share some pieces of Irish culture that the students in Brest Business School really enjoyed. Commute from Dunmore East daily. Waterford has a great public transport network with regular bus services going both locally and nationally. Waterford today is a thriving city full of the arts, history, music and culture as well as boasting a thriving sporting community. Social life in Waterford is well worth a look with many pubs and clubs dotted throughout the ancient city for anybody interested in experiencing the night life. The Viking Triangle in the city centre is a fantastic experience to enjoy with its many museums showcasing 1000 years of Waterford's rich history. The city itself is very easy to navigate around which makes it a fantastic hub in the South East of the country for students from all over Ireland and abroad.